There is a strong market for heirloom tomatoes. Consumers say they taste better and have thinner skins than “regular tomatoes.” Consumers also have a nostalgic attraction to the “ole timey” varieties that Grandma used to grow. Heirloom varieties come in many interesting colors and shapes and have fun names that make them stand out from the standard industry tomato. The market for ORGANIC heirloom tomatoes is particularly strong. This consumer interest should be an excellent opportunity for local growers, except that heirloom tomatoes have several production problems. Most heirloom tomatoes have little or no disease resistance. This makes organic production, in particular, very difficult. In a wet season, heirloom varieties often fall victim to blight before they get the chance to yield much fruit. Heirloom varieties have a tendency to crack and are often very rough in appearance, which makes them difficult to pack and sell commercially. Tomato breeder, Dr. Randy Gardner, has developed several new disease resistant experimental hybrids with heirloom qualities. Hopefully, these new hybrids will have the flavor of heirlooms but with the desired characteristics of standard commercial tomatoes, e.g., disease resistance, uniform size, and good shipping characteristics. Objectives: To compare yield, disease resistance, nutrient content, and taste of new heirloom-type hybrids and heirloom varieties grown in conventional and organic production systems. This study is a split plot design and has four replicates. Main plots are composed of four farming system treatments, Control (conventional fertilizer only), Conventional, Organic 1 (Brandt), and Organic 2. Subplots are four tomato varieties. 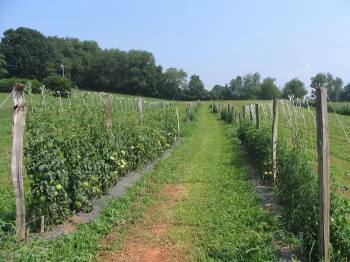 In the Conventional plots, the tomatoes are being grown using conventional practices as recommended by the N.C. Cooperative Extension Service, including synthetic fertilizers, fungicides, and insecticides. In the Organic 1 (Brandt) plots, the new Brandt ClawEl organic OMRI approved fungicide and insecticide are being used. In the Organic 2 plots, Serenade and Neem, are used as fungicide and insecticide, respectively. In all organic plots, tomatoes are being grown using organic practices as approved by the National Organic Program, including organic soil amendments, such as compost and fish emulsion. Control plots received no fungicides or insecticides, but did receive the same synthetic fertilizers as the conventional plots. In all plots, the tomatoes are grown on raised beds with black plastic and drip-irrigation and high trellises. All varieties are indeterminate. Tomatoes are being harvested weekly and analyzed according to total weight, size, and quality (including burst and crack). Two tomato hornworms in control plots. The hornworm in the foreground has been parasitized by a wasp. The hornworm in the background is healthy. Additionally disease and insect pressures are being monitored. The fungal pathogens, Alternaria and Septoria have been observed in control plots, but rarely in other treatment plots. Tomato spotted wilt is present and has killed around 8 of 640 total test plants. Late blight has not been observed, but will likely arrive in the control plots before the season’s end. 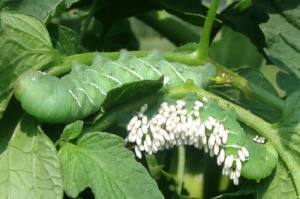 The tomato hornworm has been noted in control plots, often parasitized. However, no hornworms or other pests have been noted in any other of the cropping system plots, including the two organic plots. Plant tissue analysis is being conducted to determine the nutrient content of varieties and treatments. Results are forthcoming. A taste preference test will be conducted at today’s demonstration. We will gather data on people’s taste and shopping preferences when considering the purchase of tomatoes. 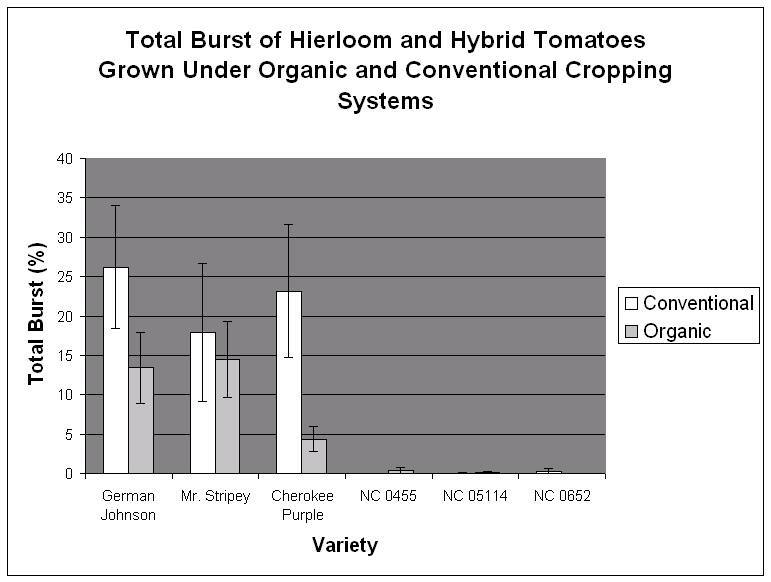 The objective of the 2006 study was to determine if three heirloom type hybrids had flavor comparable to three favorite heirloom tomatoes and to compare production in conventional and organic production systems. The study was a split-plot design with production system as the main plot and variety as the subplot. There were four replications. There was no difference in yield between organic and conventional production systems (Table 1). 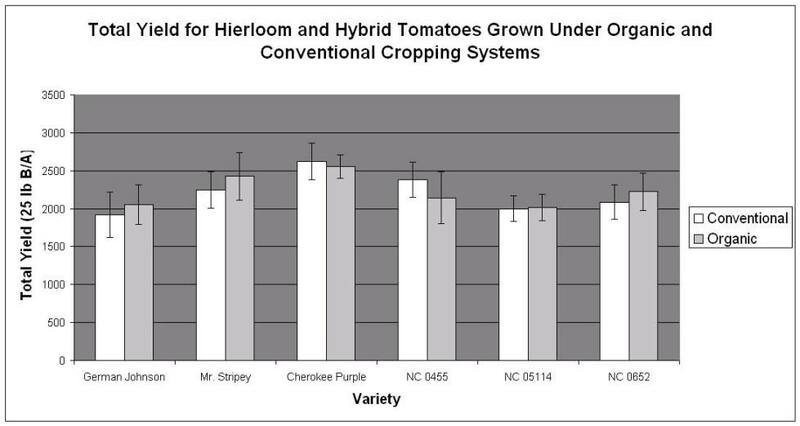 Cherokee Purple (heirloom), Mr. Stripey (heirloom), and NC0455 (hybrid) had the highest total yields. 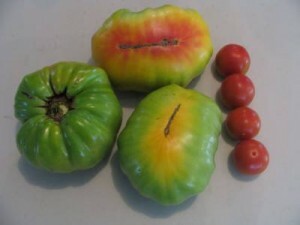 Heirloom tomato fruit tend to burst and crack. The hybrids exhibited little of these disorders (Table 2). In the taste tests, participants rated two of the hybrids, NC05114 and NC0455, as the best tasting (Table 3). 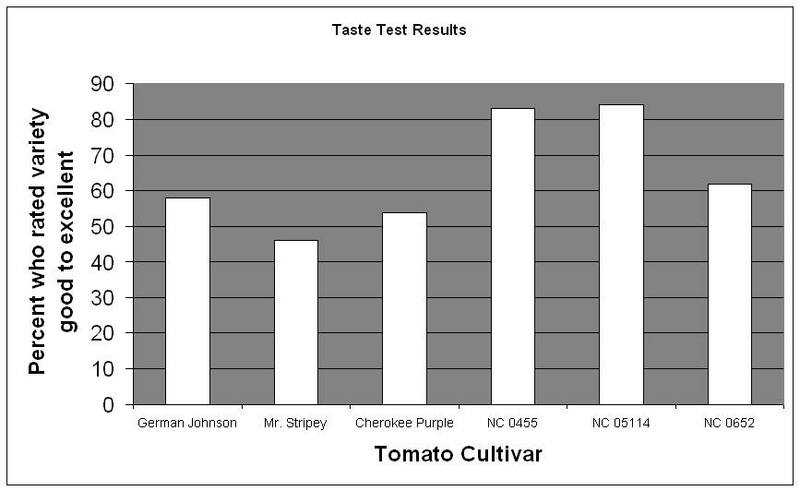 We concluded that these new hybrid tomatoes did have flavor comparable or superior to several favorite heirloom tomatoes and that they could be successfully grown in organic and conventional production systems. We gratefully acknowledge the funding provided for this project by Brandt Consolidated ClawEl. This study is a project of the N.C. Specialty Crops Program and the Farm Prosperity Project. The N.C. Specialty Crops Program is a cooperative venture between the College of Agriculture and Life Sciences at NC State University and the Marketing Division at the NC Department of Agriculture and Consumer Services. The Farm Prosperity Project is a partnership between NC State University, Land of Sky Regional Council, the Appalachian Sustainable Agriculture Project, Carolina Mountain Land Conservancy, American Farmland Trust, Southern Appalachian Highlands Conservancy, and Warren Wilson College. It is funded by a special grant from the USDA Cooperative State Research, Education and Extension Service. We wish to thank the staff at the Mountain Research Station for all their support without which, this would not be possible. Technical support is provided by Candice Anderson, Phillip Sanders, Vicky Heatherly, Amy Hamilton, Laura Duffie, Chris Leek, and Will Morrow. Marketing assistance is provided by Stephanie Wise, NCDA&CS.